We Know Your Patients Are Sleeping, Are You? 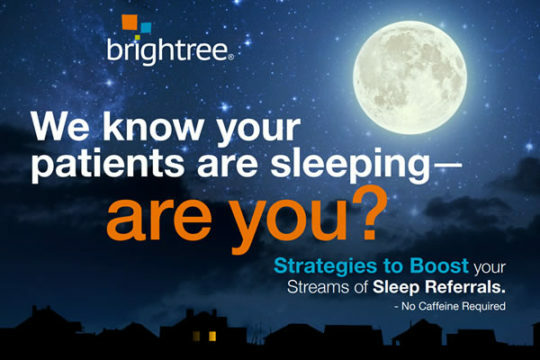 Strategies to Boost your Stream of Sleep Referrals. If you are an HME sleep therapy provider, chances are that stricter regulatory requirements, interoperability mandates, and stiffer competition weigh heavily on your mind day and night. But, you’re in luck: There’s a proven remedy to ease your mind so you can finally catch some zzzs. And that means technology and services! Sleep therapy is a growing, highly competitive and compliance-driven market, but success depends on data collection, patient outcomes, maintaining compliance, and handling industry rules and regulations. The right technology can provide you with the tools and resources to handle all these challenges, and help you maintain and grow referrals, which are the backbone of any sleep therapy business. Read this ebook to get tools and strategies that will help you manage and grow your business during the day, so that you can sleep better at night.